Austin-Koblenz Sister City Committee, in partnership with the German-Texan Heritage Society and Austin Saengerrunde brings this more than 800-year old German tradition to Texas! 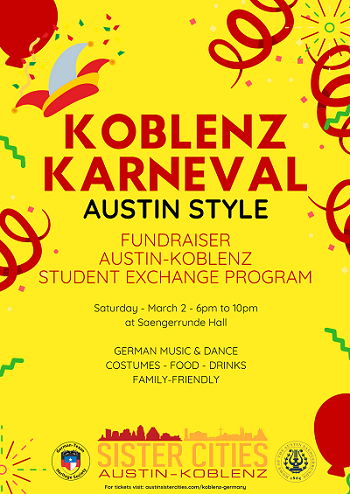 Koblenz Karneval – Austin Style is a family friendly event, and the evening’s program is wide and varied and features authentic German food, student performances, costume contests, German live music, and much more. The goal of the event is to raise funds for the ongoing Austin-Koblenz, Germany student exchanges. Click here for more information about the student exchange and sponsorship levels. Tickets include admission, food and 2 drink tickets and lots of fun. Click here to get tickets. Members of Austin-Koblenz Sister Cities, the German-Texan Heritage Society, or Austin Saengerrunde will receive discounted pricing. For more information visit https://www.austinsistercities.com/koblenz-germany.